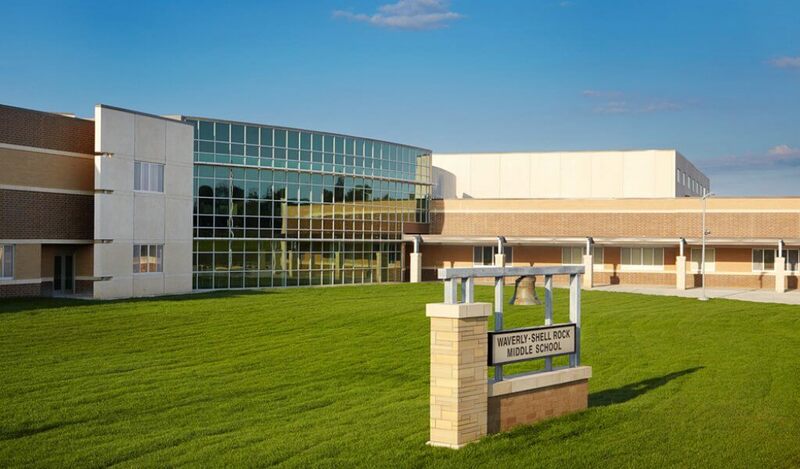 The new 170,000 square foot Waverly-Shell Rock Middle School was built to replace both of the school district’s fifth and sixth-grade elementary schools that were destroyed in a flood and a middle school that experienced partial flooding damage. The new building consists of two 2-story classroom wings anchored to a central commons area. Additional wings off the commons area include a fine arts wing and a wellness wing containing two gyms, a weight room, and a wrestling room. A precast concrete auditorium also serves as a FEMA storm shelter to protect building occupants during extreme weather events. Structural systems included precast concrete, cast-in-place concrete, structural steel, light-gage steel, and masonry framing to shape the building’s unique floor plan layout. The two-story classroom wings consist of steel framing with metal deck/concrete floor slabs and steel bar joists/metal deck roofs. Both gymnasiums consist of precast concrete wall panels with long span steel roof joists and metal roof deck. Load bearing masonry walls were utilized in the kitchen and locker room areas for durability. The building serves 750 students in 5th through 8th grade. Shuck-Britson provided structural design and construction administration services for the project.